If you want the literature imprinted, please call with your order. Personalized, imprinted literature cannot be ordered on-line! 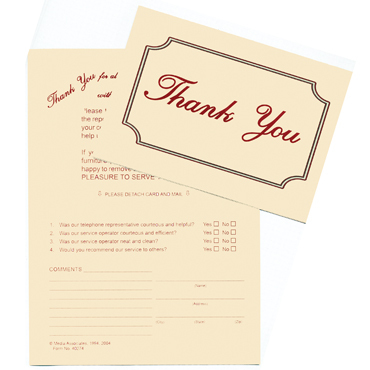 A freestanding card with not only your message of thanks to your customer but also a reply card to be mailed back to you with their comments on your professional service. Needs a stamp to be returned to you. Perforated, foldable mailable post card to thank the customer for “allowing us to come into your home with our unique cleaning system”. Its other purpose is to invite the customer to complete a simple form indicating any areas of satisfaction or dissatisfaction. Should be mailed to customer within a few days of your service. If the customer lists a complaint, you should immediately contact him/her to correct the problem. Of course, if the customer has nothing but high praise for you, you can save it to show others.